I always like to start out an article of this type with a few definitions, some of which may be totally inappropriate but all of which are intended to help the reader hang in there to read the entire article. For this reason, I'm inclined to first discuss the misconception that wry face is rye face. There's rye the cereal grain, from which we get rye bread and rye whiskey, and of course there's Catcher in the Rye by J. D. Salinger. Only with tongue in cheek is rye face closely related to wry face: after one drinks a swig of rye whiskey, he or she will likely make a wry face. For the purposes of this article, the more appropriate use of the term wry is in reference to a crooked neck--hence the condition's common name wry neck; its medical name is torticollis. As a verb, wry literally means "pull out of proper shape, make awry"; as an adjective, it means "having a bent or twisted shape or condition, turned abnormally to one side," and "wrongheaded." When applied to the face, it means an altered facial conformation. Theoretically, the principal facial bones that would be involved in wry face are the mandible (lower jaw) and the maxilla (upper jaw), separately or in combination. In reality, the problem, as I've observed it in both llamas and alpacas, has markedly involved the maxilla and only subtly the mandible. 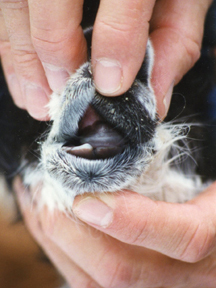 While the numbers of observed and reported cases in North America to date favor the llama, there are increasing cases in alpacas as their populations increase. On occasion I've been asked to render an opinion on a newborn camelid that "appears to have a crooked nose." Fortunately, in most of these instances, I've been convinced that there is a suggestion of a crooked nose only because of either a whorl (cowlick) of hair or a pigment design change, and that the nose is really normal. To date, wry face individuals have been quite grossly affected at birth and can be readily diagnosed; however, I would be the first to admit there could be some minimally affected cases out there. 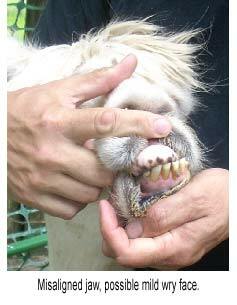 Wryface is most easily recognized by the lack of proper dental occlusion. 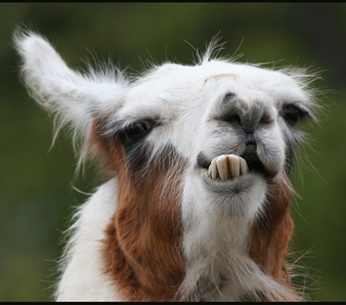 Photos of Wryface in llamas and alpacas. We have had some wry face individuals presented or donated to the Veterinary Teaching Hospital at Colorado State University (CSU) in late juvenile as well as adult ages. What has really impressed me about these and other cases is that the animals somehow are able to learn to nurse and fend for themselves at the feed bunk quite effectively. 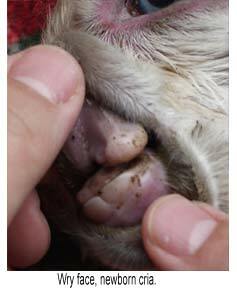 This is all the more amazing because the molars and premolars of the affected animal's two jaws lack proper dental occlusion and the mandibular incisors make virtually no contact with the maxillary dental pad. No doubt in a true browsing/grazing situation, affected individuals would have a tough time surviving. Another fairly consistent problem of affected individuals is a compromise of the normal drainage duct (nasolacrimal duct) from the eye to the nose, causing a constant tear staining. The cause appears to be compression of the duct and the result is partial or full obstruction. The combination of poor dental occlusion and the tendency toward chronic tearing and eye afflictions often causes affected surviving individuals to be "poor doers"; hence they are generally euthanized because of their poor prognosis for a quality life. Now, do I know that wry face is a genetic problem? No, I'll have to admit that I don't know that any abnormality seen to date is absolutely for sure genetic in origin. 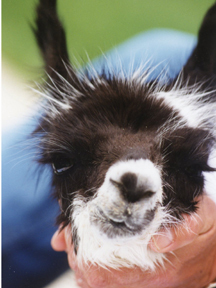 I will note that our now-departed colleague, Dr. Horst Leipold (regarded in most circles as the guru of genetic and congenital defects), was outspokenly confident that most facial defects of camelids (choanal atresia, wry face, cleft palate) are very likely genetic in origin. As an example from my own experience, I'll cite a female llama, Prima, that was bred to the same male for three consecutive years and delivered two consecutive wry face crias and then a "normal" one. After Prima was donated to CSU, it was bred to several studs and subsequently has never produced another affected individual in the resultant five offspring. I have previously expressed an opinion that wry face and choanal atresia have some relationship. 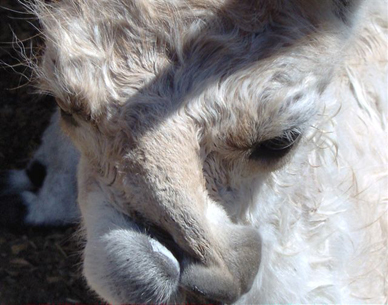 I was somewhat qualifiedly pleased that a female llama with a track record of two consecutive choanal atresia babies produced a third choanal atresia cria in a mating with a wry-faced male. Subsequently the same mating has produced what appears to be a perfectly "normal" female cria that is both woolly and appaloosa, traits that neither parent possesses phenotypically. Isn't genetics wonderful? Prima and three daughters that could be carriers of the wry face trait currently reside at CSU. In addition, two gelding sons that guard sheep are in the area. We have been breeding all the CSU female herd to "DH," our resident wry face stud. To date, with five crias born, none appears to be clinically affected. Perhaps this year? Unfortunately, Prima is now infertile and the current herd does not include any wry face individuals or phenotypically normal females with a track record of producing wry face crias. I have been accumulating and freezing blood and tissue samples from affected llama and alpaca crias that I have been made aware of as well as from their parents. At this point, I'm assuming that the problem is genetic in origin and likely involves both parents. If it indeed is genetic, the mode of inheritance is not clear. I'd be surprised if it were simply Mendelian recessive in nature. More likely, multiple alleles are influencing the occurrence with possible incomplete penetrance. If that is the case, suffice it to say that the mode of inheritance is complicated. Simple breeding trials such as those I am currently performing will not readily assist in determining the mode of inheritance; nor will they practically assist in determining the presumed carrier status of incriminated parents. What's really needed is cooperative research in the areas of chromosome analysis, gene mapping, and perhaps DNA fingerprinting. These technologies and associated research are not something we are currently engaged in at CSU. My hope is that individuals currently involved in these areas will be inclined to put forth a cooperative effort with us, using the CSU herd, likely the most concentrated group of animals with the wry face problem, and our samples. In summary, wry face does have a significant but as yet undocumented occurrence in both domesticated camelid species. I would hope that you, like me, are convinced that the wry face condition is a serious problem in camelids, and furthermore, that research using advanced genetic techniques is the next step in understanding the condition. I would challenge you as responsible breeders to carefully consider the occurrence of all facial defects, including, especially, choanal atresia and wry face, to likely be genetic in origin until proven otherwise. There are surgeons who could "correct/improve" the physical appearance of affected animals; however, such individuals should never be falsely represented at shows or sold without revealing their altered history; nor, in my opinion, should they be used for breeding purposes. LaRue W. Johnson is full professor and section chief of Food Animal Medicine and Surgery, College of Veterinary Medicine, Colorado State University, where he has taught since 1976. He has worked with llamas for fifteen-plus years and alpacas for the past five. 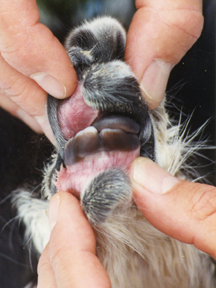 Dr. Johnson has been a speaker at most veterinary and camelid organizations and is current president of the American Association of Small Ruminant Practitioners. He has edited two editions of Veterinary Clinics of North America--Llama Medicine. He received his BS, DVM, and PhD from the University of Minnesota. alignment with the upper jaw. in alignment to the maxilla (upper jaw). 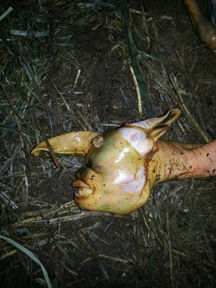 The lower jaw is shifted to the left. Wry Face along with other birth defects.